The whole mountain range stretches at least from the Lopper just opposite from Stansstad to the east as far as at least to the Mittaggüpfi (1,917 m (6,289 ft)) and the Risetestock (1,759 m (5,771 ft)) to the west on the border between LU and OW. The highest peak, Tomlishorn (2,128 m (6,982 ft)), and the other peaks, such as Widderfeld (2,076 m (6,811 ft)) even further west than the Tomlishorn on the border between LU and OW, Matthorn (2,040 m (6,690 ft)) to the south, the Klimsenhorn (1,906 m (6,253 ft)) to the north (UW), and Rosegg (1,974 m (6,476 ft)) and Windegg (1,673 m (5,489 ft)) to the east, both on the border of UW and OW, should only be approached with appropriate Alpine hiking equipment. 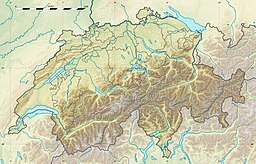 Jurisdiction over the massif is divided between the cantons of Obwalden (OW), Nidwalden (NW), and Lucerne (LU). The main peaks are right on the border between Obwalden and Nidwalden. The top can be reached with the Pilatus Railway, the world's steepest cogwheel railway, from Alpnachstad, operating from May to November (depending on snow conditions) and the whole year with the aerial panorama gondolas and aerial cableways from Kriens. Tomlishorn is located about 1.3 km (0.81 mi) to the southeast of the top cable car and cog railway station. Two other peaks, closer to the stations are called Esel (Donkey, 2,118 m (6,949 ft)), which lies just east over the railway station, the one on the west side is called Oberhaupt (Head-Leader, 2,105 m (6,906 ft)). During the summer, the "Golden Round Trip" — a popular route for tourists — involves taking a boat from Lucerne across Lake Lucerne to Alpnachstad, going up on the cogwheel railway, coming down on the aerial cableways and panorama gondolas, and taking a bus back to Lucerne. A few different local legends about the origin of the name exist. One claims that Pilatus was named so because Pontius Pilate was buried there. However, a similar legend is told of Monte Vettore in Italy. Another is that the mountain looks like the belly of a large man, Pilate, lying on his back and was thus named for him. The name may also be derived from "pileatus," meaning "cloud-topped." A medieval legend had dragons with healing powers living on the mountain. A chronicle from 1619 reads: 'as I was contemplating the serene sky by night, I saw a very bright dragon with flapping wings go from a cave in a great rock in the mount called Pilatus toward another cave, known as Flue, on the opposite side of the lake'. This legend was the inspiration for Steven Reineke's famous concert band piece, Pilatus: Mountain of Dragons. Numbered amongst those who have reached its summit are Conrad Gessner, Theodore Roosevelt, Arthur Schopenhauer (1804), Queen Victoria and Julia Ward Howe (1867). The mountain has fortified radar (part of the Swiss FLORAKO system) and weather stations on the Oberhaupt summit, not open to the public view and used all year round. In The Chalet School Does It Again. (1955) Elinor Brent-Dyer retells the Pilate burial place legend. Mount Pilatus plays a pivotal role in the conclusion of Brad Thor's fiction novel Lions of Lucerne. ^ Retrieved from the Swisstopo topographic maps. The key col is the Glaubenberg Pass (1,543 m). ^ Retrieved from Google Earth. The nearest point of higher elevation is north of the Widderfeld Stock. ^ "Dragon Legends – Pilatus Bahnen". Retrieved 10 September 2015. ^ "Dragons in Swtizerland". Strangehistory.net. Beachcombing's Bizarre History Blog. Retrieved 2017-01-08. ^ "Steven Reineke – Our Composers". Barnhouse.com. C. L. Barnhouse Company. Retrieved 2017-01-08. ^ "Climate Normals Pilatus, Reference Period 1981-2010" (PDF). Zurich Airport, Switzerland: Federal Office of Meteorology and Climatology – MeteoSwiss. Retrieved 2016-11-14. Wikimedia Commons has media related to Pilatus.